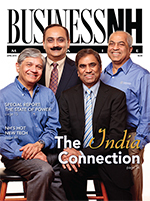 The India Connection A surprising number of the state's cutting edge businesses are run by Asian Indians. The State of Power This special report on energy looks at energy research being conducted at NH colleges and universities, the status of the Northern Pass Project, and an update on wind farms. Top Engineering Firms Who's on top and who's not! The Engineering Dilemma What challenges are engineering firms facing. NH's Hot New Tech Get ready to geek out as we present some of the hottest new products rolled out by NH companies.